THE 1917 floods were the second highest recorded in Albury-Wodonga. The gauge at the Union Bridge was 18 feet. 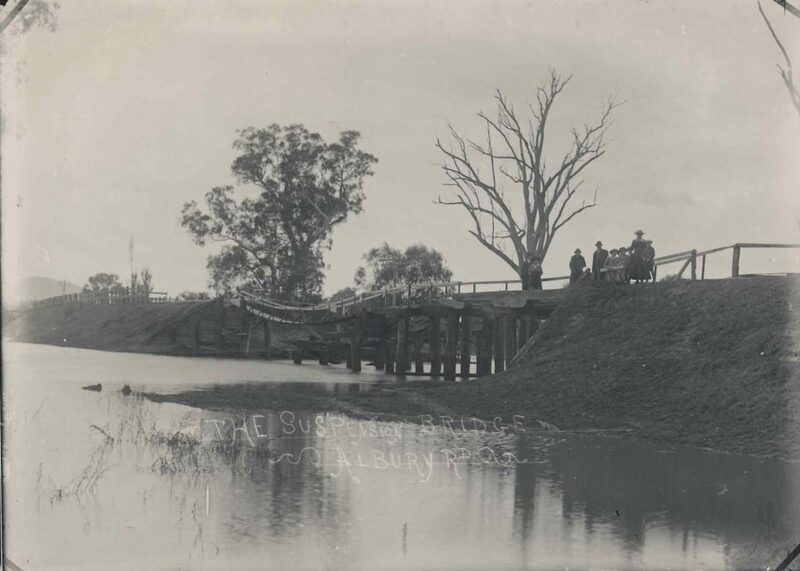 All bridges between Albury and Wodonga were washed away and locals had to travel by train between the two towns. It was the the only link between the centres for several weeks. The suspension bridge was a temporary fix to allow pedestrian traffic to travel between Wodonga and Albury. A report from The Argus on October 9, 1917 stated: “For the last three or four months the low-lying land between the border towns of Albury and Wodonga has been almost continuously under water, 150 points were registered here on Thursday and Friday and heavier falls were recorded higher up the river, causing all rivers to rise simultaneously. Residents of Bonegilla, Bethanga, Talgarno and the Murray Valley were cut off from railway facilities. Some of the oldest residents claim this to be the highest flood since 1870. Men have been engaged constantly keeping logs and other floating debris from accumulating against the railway bridges”. In 1974, two floods were recorded in January and October and the fourth highest on record. The Murray River reached 5.46 metres, a total of 1.19 metres over flood level. Hundreds of transports waited in Albury and Wodonga for permission to drive on to the Lincoln Causeway, which was closed. All other traffic was diverted around the Hume Weir wall. Special trains ran between Wodonga and Albury for two days to ferry people to and from work. In 1975 the third highest flood on record occurred. People were ferried by train between Wodonga and Albury and boats were a common sight travelling both ways. The late Bob Wiltshire had reported that the floods didn’t come from the Hume Weir but from the Kiewa River which bypasses it, where inches of rain had fallen in a relatively short time. He recalled being one of around 200 volunteers who worked thigh deep in water, filling sandbags to protect a hide and skin business, Weatherall’s Masonry and the Milos building, all on the flood plain. Wodonga Historical Society member Jim Parker remembers sandbagging the butter factory. The highest flood recorded was in 1870 when the water reached Dean Street. Like the Wodonga Historical Society’s facebook page. The society posts a picture each day and values input of memories invoked. It meets the first Tuesday of the month at Wodonga Football Club rooms from 2pm.